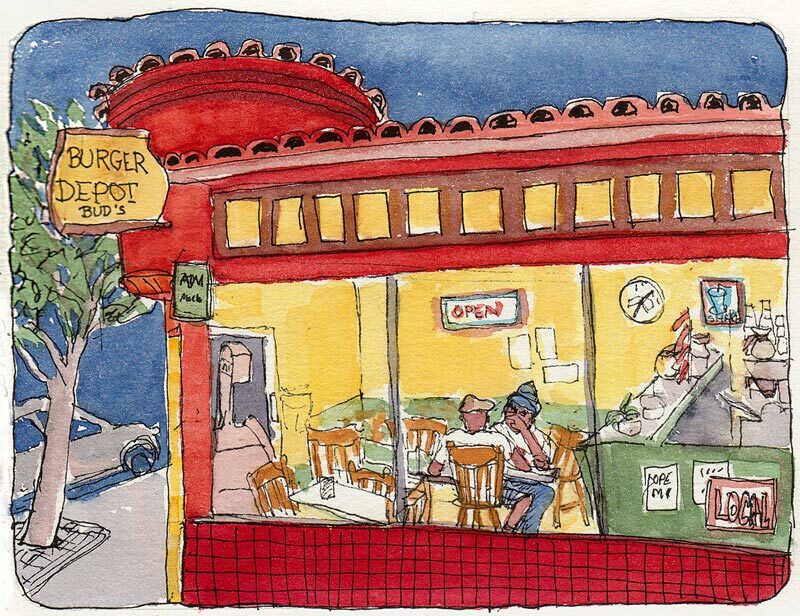 Burger Depot, Ink & watercolor, 5x7"
Trying to get in one last outdoor evening sketch session of the season, we sketched at the bottom of Solano Avenue in Albany. I stood under a street lamp and by the time I finished drawing it was dark out. The proprietor of the Burger Depot who has owned the shop for over 30 years saw me trying to paint standing, with my palette and water on the ground, and brought over a plastic chair and a little table for me. The street light and light from inside the shop gave me just enough light to see what I was doing. I was initially drawn to the scene by two seedy looking guys sitting in a window seat but they left before I could draw them. Fortunately the other two guys eating there were wonderful models who kept returning to the same positions, making it easy-ish to draw them. You had a modern day Hopper moment with your Nighthawks restaurant scene:) Nice of the owner to bring you a chair and table also. Great sketch. I love the colors you have here too. Maybe you should give the owner a copy of it! He was sure nice to bring you a chair and table. I think the world is full of nice people. We just have to open our eyes. I thought of Hopper when I saw this too! Well done! How nice of the guy to bring you a table and chair! You always manage to capture a good amount of information in an interesting way in your sketches!